(Bloomberg) – Federal Reserve officials left interest rates unchanged while acknowledging rising confidence among consumers and businesses following Donald Trump’s election victory. ‘Measures of consumer and business sentiment have improved of late,’ the Federal Open Market Committee said in its statement Wednesday following a two-day meeting in Washington. Policy makers reiterated their expectations for moderate economic growth, ‘some further strengthening’ in the labor market and a return to 2 percent inflation. The Fed provided little direction on when it might next raise borrowing costs, as officials grapple with the uncertainty created by a new presidential administration. Policy makers in December penciled three rate hikes into their 2017 forecasts, but committee members differ over assumptions regarding the extent to which tax cuts, spending and regulatory rollbacks proposed by Trump and Republicans might boost growth and inflation. This post was published at Wall Street Examiner by Anthony B. Sanders ‘ February 1, 2017. The specter of global stagflation is looming ever larger as inflation across the world is beating analysts’ forecasts (even before the potential effect from Donald Trump’s economic policies) but economic growth expectations remain stagnant. As Bloomberg notes, the global Citi Inflation Surprise Index, which measures price surprises relative to market expectations, is at the highest in more than five years. This post was published at Zero Hedge on Feb 1, 2017. Ep. 225: U. S. Dollar Has Worst January In 30 Years! Call it stagnation, stagflation, or ordinary performance, there are reasons economic growth has moderated including demographics, declining productivity, low savings, low investment, erosion of the middle class, devastating recessions, automation leading to slow job growth, and high debt levels. The need to reform international tax codes is recognized by the OECD and WTO and is an evolving process. Corporate tax reform will be beneficial to ‘adjust’ for the U. S. tax system being based on income and the most of the rest of the world relying more on consumption (VAT) taxes. Tax reform may increase revenues by reducing the incentives to seek tax havens. High social entitlements and benefits enacted during periods of high growth cannot be supported during periods of slow growth. Reducing top tax rates and capital gains taxes will continue to benefit the wealthy more than the middle class, but will increase investment in the U. S. and reduce tax evasion. The trade imbalance is largely the result of low savings and capital flows and their impact on exchange rates. ‘Fair’ trade is beneficial to the U. S. economy and to U. S. firms. The current reforms and stimulus are likely to provide a temporary boost to the economy, but long-term growth of 4% is highly unlikely. This post was published at FinancialSense on 02/01/2017. Having decided to actively increase its risk exposure over the past few years, including venturing into high beta stocks and junk bonds – a gamble that has lead to a big jump in quarterly volatility not to mention significant downside risk should global markets suffer a crash – Japan’s Government Pension Investment Fund, or GPIF, the world’s largest pension fund, has decided to invest in US infrastructure projects next. According to Japan’s Nikkei, infrastructure investments in the U. S. by Japan’s GPIF will feature heavily in the economic cooperation package to be discussed at next week’s summit in Washington between the two countries’ leaders. The stated goal is to create “hundreds of thousands of American jobs”, in keeping with U. S. President Donald Trump’s agenda, and deepen ties between the two countries. The unstated goal is to avoid Trump lashing out at Japan as a currency manipulator, and putting in peril Japan’s QQE “with curve control” experiment, which is the bedrock of all Abenomics (as further expained in the following Nikkei piece). Japan has grown nervous that after Mexico, China and Germany, it may be next nation to find itself in Trump’s spotlight, something Trump hinted at yesterday during his meeting with pharma CEOs when he said that “other countries take advantage of America by devaluation,” and then directly named China and Japan as “planning money markets,” presumably implying manipulation. The FOMC kept policy rates unchanged today and made few revisions to its statement. We see limited implications for the near-term policy outlook, and continue to assign a 35% chance that the committee raises rates as soon as the March 14-15 meeting. Our modal forecast remains three hikes this year, at the June, September and December FOMC meetings. 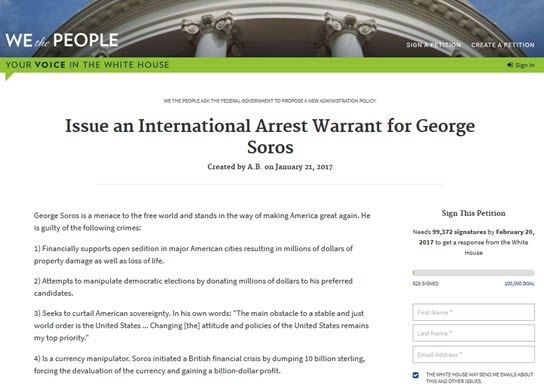 Although it hasn’t received very many signatures yet, someone decided to use Obama’s ‘We the People’ White House petition website to put up a request under President Trump for an international arrest warrant to be issued for George Soros. This post was published at The Daily Sheeple on FEBRUARY 1, 2017. In the year 440 BC, more than two decades into the reign of Pericles, an audit of treasury in Athens showed a massive surplus of more than 9700 ‘talents’. And, based on today’s precious metals prices and the traditional gold/silver ratio (14:1) used by the ancient Greeks, 9700 talents is equivalent to about $700 million today. At the time, Athens boasted a population of around 43,000 citizens and 28,500 foreign residents… so on a ‘per capita’ basis, the ancient Athenian surplus amounted to just under $10,000 per person in today’s money. If you compare this figure to our modern world, it’s pretty extraordinary. The United States doesn’t even have a surplus. So ancient Athens was actually far wealthier than just about every country in our modern world. Today things are obviously quite different for Greece. This post was published at Sovereign Man on February 1, 2017. Is Gold & Silver’s Speed Bump Behind Us? The Fed did nothing today, and their jawbones must have been fatigued. Stocks continued in a relatively narrow range. Gold and silver continued to hover underneath overhead resistance. There will be a Non-Farm Payrolls report on Friday. It just became much more interesting because the ADP private employment report came in today far to the upside. Details are in the economic news slide below. 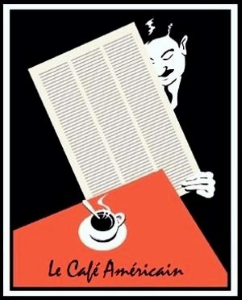 Everything seems to be a mixed bag in the news. Trump is injecting plenty of uncertainty, but the rally of hope for change continues hanging in there. There is a huge divergence between the ‘soft surprises’ and ‘hard surprises’ in the company earnings reports. The hard data is of course money, and the soft surprises are found in clicks and tricks, and assorted metrics of the non-financial sort. I have trouble taking a non-haven position in these markets, because I just cannot escape the feeling that we are in for a really serious breakout, one way or another. But so far, no. This post was published at Jesses Crossroads Cafe on 01 FEBRUARY 2017. This post was published at GoldSeek on 1 February 2017. As was largely expected – and in spite of a whiney distraction from Jeremy Corbyn on Trump – UK Prime Minister Theresa May crossed the first hurdle towards Brexit as The House of Commons easily passed a bill authorizing the start of European Union exit talks. As AP reports, British lawmakers have backed a bill authorizing the start of European Union exit talks, voting by a decisive 498 to 114 to push the measure past its first major legislative hurdle. Global stocks generally rebounded Wednesday after posting losses earlier this week. China markets remained closed for the Lunar New Year holiday. U. S. stock indexes are pointed toward firmer openings when the U. S. day session begins. Gold prices are trading modestly higher after scoring solid gains on Tuesday. It’s going to be a very busy data day for the U. S. markets Wednesday. The Federal Reserve’s FOMC meeting that began Tuesday morning ends Wednesday afternoon with a statement. No change in U. S. interest rates or monetary policy is expected. However, the wording of today’s FOMC statement will be closely scrutinized for clues regarding the future path of monetary policy. This post was published at Wall Street Examiner on February 1, 2017. Expect the Fed to take out one of the last pillars of dollar support today. Dollar bulls are still not capitulating despite it being on target for a sixth consecutive week of losses. While some doubts are finally starting to creep in, the majority of analyst notes this week suggest the FOMC can put the dollar uptrend back on track. I’m surprised. With gold gaining, dollar declining, a flattening yield curve, and a market not buying The Fed’s 3-hikes plan, Janet and her band of merry-men (and women) had to do something to get investors’ confidence back to signal ‘March is live’, as Trumponomics dominates the conversation, but it appears they failed. FED SAYS CONSUMER, BUSINESS SENTIMENT HAVE IMPROVED OF LATE FED REPEATS NEAR-TERM RISKS TO OUTLOOK `ROUGHLY BALANCED’ FED SAYS MARKET-BASED INFLATION GAUGES `REMAIN LOW’ It may have failed, however, because the biggest highlight of the February statement (link) appears to be the line that “Market-based measures of inflation compensation remain low“, which has been revised from the December version to remove the “measures have moved up considerably” language in what may be a dovish revision, and as such it appears the Fed is converging with the market’s view of just 2 rate hikes in 2017. The machines were all primed and ready to juice the market and as The Fed statement hit, VIX collapsed – flash-crashing to a 9 handle. Jeff interviews Bix Wier of Road to Roota, topics include: the good guys are winning! Trump had to make certain unfortunate appointments just to get this far, Trump to free up markets, Trump to increase debt, Trump to pop the bubbles early in his term, tackle the Fed, end gold and silver price suppression, China and Bitcoin, paper trades vastly outnumber physical trades, Bitcoin derivatives, Mexico and silver, silver price determined by the comex and paper markets, silver greatly under valued, when the market turns paper will be dumped, this years TDV Summit in Acapulco, Mexico. Despite today’s unexpectedly strong ADP and ISM report, which however followed a disappointing Q4 GDP print, the FOMC meeting at 2pm should be largely uneventful. The Federal Reserve, which won’t have seen Friday’s payroll report yet, will only release its statement without a press conference or Summary of Economic Projections. This offers market participants less information to digest and react to, and therefore consensus expects no change from the Fed. It’s been a month now that investors and analysts have been closely watching two main drivers for oil prices: how OPEC is doing with the supply-cut deal, and how U. S. shale is responding to fifty-plus-dollar oil with rebounding drilling activity. Those two main factors are largely neutralizing each other, and are putting a floor and a cap to a price range of between $50 and $60. The U. S. rig count has been rising, while OPEC seems unfazed by the resurgence in North American shale activity and is trying to convince the market (and itself) and prove that it would be mostly adhering to the promise to curtail supply in an effort to boost prices and bring markets back to balance. In the next couple of months, official production figures will point to who’s winning this round of the oil wars.